Though Kansas appeared to have moved on from Lagerald Vick after he declared for the NBA Draft, he'll now return to the Jayhawks for his senior season. LAWRENCE, Kan. — Lagerald Vick has decided to return to Kansas for his senior season, nearly three months after he declared his intentions to play professionally and the Jayhawks had seemingly moved on. 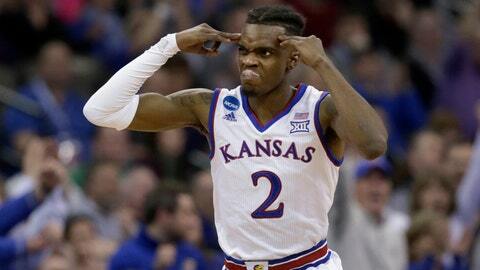 Vick and Kansas coach Bill Self announced the decision in a statement Friday night. The 6-foot-5 shooting guard averaged 12.1 points and 4.8 rebounds last season, when he started 35 of 39 games for a team that reached the Final Four. Vick declared for the NBA draft on April 6. Though he never hired an agent and eventually pulled himself out of the draft pool, the Jayhawks recruited as if Vick would not be back with the team. Though he could have pursued a pro career overseas or transferred elsewhere, Vick eventually decided to return to the Jayhawks. He plans to rejoin the team next week, providing some experience to a youthful but crowded backcourt, and potentially creating a logjam for minutes for a team with national title aspirations.